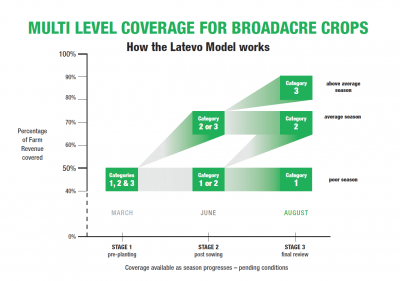 LATEVO has re-entered the multi-peril crop insurance market with a three-tiered level of cover available to growers for $14-$26 per hectare which will cover 40-90 per cent of average crop income. Growers can apply for a Latevo Farm Income Protection policy through the new Latevo app. Latevo chief executive, Andrew Trotter, said the new offering, known as Latevo Farm Income Protection (FIP), came in at around the cost of a summer spray. “We needed to find like-minded partners for this unique product, and we’ve been able to find them in certain underwriters at Lloyd’s,” Mr Trotter said. Latevo offered mult-peril crop insurance policies in 2014-2016, but did not offer cover last year as it searched for new underwriters. “Our new model is split into three categories, enabling progression during the season, depending on seasonal conditions and the grower’s choice,” he said. Mr Trotter said in some cases, Latevo policies were half the price of similar ones it offered in previous years. 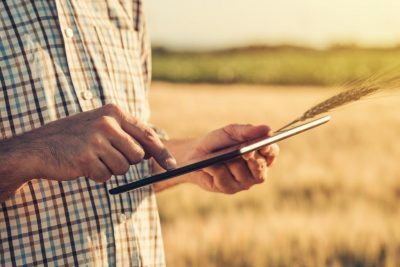 Latevo has enlisted technology in its new platform by working with Agri-Analytics on its online application process through the Latevo app, and Geosys to monitor crop conditions. Latevo’s head of operations, Felicity Nolen, said the outsourcing of individual financial assessment to Agri-Analytics had been “a massive step forward” in simplifying the application process. “The key to delivering the best price point to farmers is our high-level of due diligence in assessing each farming entity on their individual merits,” Ms Nolen said. Latevo Crop Monitor, which incorporates an on-farm weather station, is a further adjunct to the company’s FIP offering. Developed by Geosys from its Croptical platform, Latevo Crop Monitor integrates Latevo’s proprietary algorithms to better monitor crops throughout the season. “The addition of the Latevo Crop Monitor to both our underwriting and client offering is a massive step forward in helping our farmers achieve their potential yields,” Mr Trotter said. Mr Trotter said Latevo Crop Monitor allowed real-time access to farmers about their crops and the season, information needed to build grower confidence about crop insurance in Australia. Latevo FIP provides income protection in the event of crops being hit by drought, flood, frost, heat stress or other designated perils, including overspray, or significant damage from wildlife or wandering livestock. It is being offered to growers through a network of brokers and agents, and in three categories. Category 1 is suited to below-average seasons, or the start of the growing season. It gives cover at 40-50pc of farm revenue, and does not require a detailed income assessment. Category 2 covers 65-75pc of farm revenue, and is suitable for an average season, while Category 3 covers 80-90pc, and is available for above-average seasons. Categories 2 and 3 require individual farm entity assessments for a one-off fee of $5000 plus GST, which is eligible for a $2500 rebate through the Federal Government’s Managing Farm Risk Program.